AÂ 5 x 6 window decal for your car window, your mailbox, your notebook or briefcase – anywhere people can see it and know that you support the Mounted Eagles therapeutic horsemanship program. Spread the word to friends and family so they can purchase one too. SPECIAL CLOSE-OUT PRICE!!! 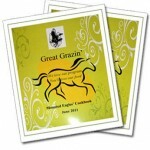 !Â Reg 2for$25Â Now 2for$15Â Make Great Gifts for Motherâ€™s Day Get two copies of the 20th Anniversary edition of Great Grazin’ Pasture II.Â A book of celebration recipes! SPECIAL CLOSE-OUT PRICE!!! 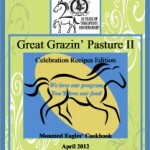 !Â Reg $20 Now $10Â Make Great Gifts for Motherâ€™s Day Great Grazin’ Pasture II 2012Â is a compilation of favorite Celebration Recipes collected from our program families and their families.Â It’s in honor of our 20th Anniversary Celebration. SPECIAL CLOSE-OUT PRICE!!! !Â Â Reg 2for$25Â Now 2for$15Â Make Great Gifts for Motherâ€™s Day Two copies of our 2011 cookbook. SPECIAL CLOSE-OUT PRICE!!! 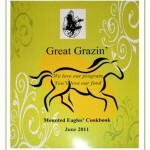 !Â Â Â Â Reg $20 Now $10Â Â Make Great Gifts for Motherâ€™s Day The more than 200 recipes in this cookbook created by Mounted Eagles participants.